At Duck Duck Moose we strive to make fun and engaging apps that encourage imagination, creativity, and learning in children. We were founded in 2008 by three friends who were intrigued by the possibility of helping shape a child’s learning in positive ways. Since then, we’ve grown to a team of energetic designers, artists, engineers, and educators who are passionate about creating the next generation of learning apps for kids to grow up with. We are now part of Khan Academy, a nonprofit with a mission to provide a free, world-class education for anyone, anywhere. We rely on our community of volunteers and donors. Get involved and help children around the world learn! 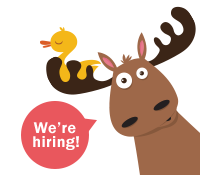 If you’re interested in another role, please send your resume to careers@duckduckmoose.com.